Wondering if a food processor can help you in the kitchen? Here’s the story of our love affair. I am not a person to care about boats or cars. I drive a 96 minivan or sometimes a 02 SUV. Apparently, big ticket items don’t thrill me. Small kitchen appliances? Well, I get absolutely giddy about tools that will make my time in the kitchen easier. Last week I shared my love for the bread machine. Today? My dad bought my mom a food processor when they were first the rage. He owned a Montgomery Wards catalog store at the time, so he probably got a good discount. My mom thought it was a pain to clean. My dad has a weird thing about storing appliances in their packaging. Between those two circumstances, that food processor stayed in its box for my tenure in that home. Years later when I was a newlywed, an old family friend was downsizing. Dr and Mrs Goldman were fairly well-to-do and had never had children. They were elderly and she was no longer going to cook. She was dismantling her kitchen and offed me their Cuisinart, probably one of the first to come down the assembly line. That baby was a workhorse. I loved it. It shredded cheese, chopped vegetables, mixed salsa, and made pie crust like nobody’s business. I found it to be particularly helpful with big freezer cooking sessions. And cleaning? It really wasn’t that much of a pain. Once we moved to a home with a dishwasher, it became as easy as, well, pie crust in a food processor. That early model was amazing. It’s motor worked like a champ. Unfortunately, the bowl did not. Eventually, the bowl became cracked in numerous places, lost its handle, and eventually lost the safety mechanism that let the bowl closed during use. At the time of the bowl’s demise, we were really strapped for cash. A replacement bowl was more than the lower model machine that my dad eventually bought me for Christmas. If I knew then how amazing that motor was, I would have replaced the bowl instead. Overtime I’ve realized that older machines are worth their salt while the newer ones? Not so much. The newer model (similar to this) that my dad bought circa 2001 worked great. it had fewer attachments than Mrs. Goldman’s, but enough to do the job. And no, the parts were not interchangeable. The motor is still going strong. The bowl? Not so much. The plunger is missing, the bowl is pretty worn, the handle broke off long ago. It’s a sad state of affairs. WHY do manufacturers create these great motors and not accompany them with great bread pans or great processor bowls?! A few years ago, hubs encouraged me to invest some book money in a new food processor. He was getting a little leery of my using a wooden spoon as a replacement plunger. The cost of a replacement plunger was a significant percentage of a new machine. I chose a fancy Cuisinart with all the bells and whistles. The one I had been ogling from afar, though I did not pay more than $200 for it. With multiple, different sized bowls and multiple attachments, it promised to do all kinds of great things for me. Normally loathe to read the directions, I even watched the demonstration DVD that came with the machine. Eventually. But, you know what? This baby really is hard to clean. The bowl lids, while probably sturdier than the broken bowls of my past, have gaskets that trap food and are a pain to clean. The storage box for the attachments, while clever, is large and relegated to a top shelf, making me less likely to use it. I love my food processor and use it daily. Sure, a good knife or a box grater can fill the bill. But since I cook for a small army, I don’t want to spend an hour shredding cheese when the machine can do it in minutes. Only I don’t usually use my bells and whistles Cuisinart. It’s too hard to clean so it sits in the cupboard. I’m more like my parents than I thought. Instead, I hijacked its plunger and continue on with my old decrepit machine, circa 2001. At least I won’t chop off my hand or shoot wooden spoon splinters up my nose. I don’t know that you really need any extras to make good use of a food processor. Provided you have all the pieces that came with your machine. My 2001 model came with a very hard plastic spatula which has proven to be very handy to scrape the bowl. Rubber spatulas tend to get caught in the blade, so a harder plastic one is very nice to have. As I’ve mentioned, a food processor does a lot to quicken your kitchen prep work. I use it for a number of things from shredding or chopping vegetables, mixing pesto sauces, blending other sauces and salsas, making pie crust or biscuit dough, mixing cookie dough, chopping nuts, slicing potatoes, etc. 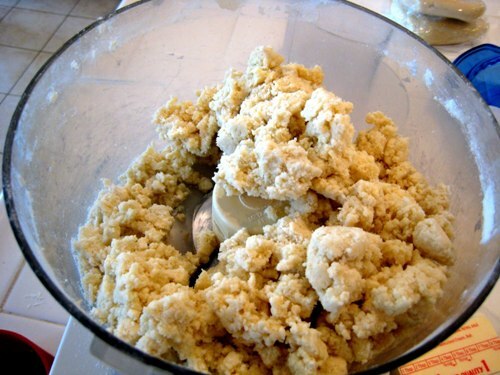 Anything that needs to be chopped or mixed can be done in a food processor. Except for pizza dough or other bread doughs. I’ve seen recipes for such, but you’ll need to follow their method carefully as the blades of a processor don’t really work for bread. Since I use my basic machine, care of the machine is pretty easy. I rinse the parts after use and then run through the dishwasher. I store the motor and bowl parts in the cupboard. Turn the lid upside down in the bowl to conserve space. I keep the disks near the machine in the cupboard, but store the blade in the back of my baking drawer to minimize the risk of someone getting cut. I’ve had three food processors in twenty years. Two still work. Obviously Cuisinart bowls of the past could not live as long as their motors. I don’t know about the new ones. I’ll let you know when Cuisinart Bowl #2 bites the dust and I am forced to use the new one. I have only purchased Cuisinarts so I can’t speak to other brands. I’d get the biggest bowl size you can afford and easily store. Make sure it comes with a metal blade as well as slicing and shredding disks. If you can go to a kitchen store to see the gasket to close the lid, choose a model that looks easy to clean. Consider borrowing one before you buy. Or troll your local thrift stores and garage sales. Chances are somebody bought a fancy machine and it just stayed in the box. Who knows? Someday you might get a great deal on my fancy pants machine that I never use. What’s your experience with a food processor? I had some kind of food processor in the mid 80s that may have been a Cuisinart. I’m not sure. The name would have meant nothing to me then. Whatever it was, I thought it was more trouble than it was worth and didn’t use it more than once or twice. 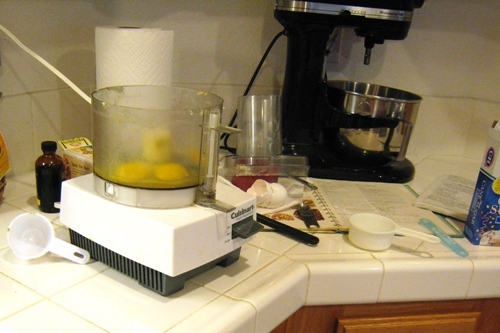 I bought an inexpensive Hamilton Beach model around 2000 for about $30. I used it a lot, but it either quit working or the bowl broke. I can’t remember now what happened to it, but I replaced it with another very similar Hamilton Beach. I’ve been using it for about 10 years. Ended up stripping the spindle in it, but ordered a new part. It didn’t quite fit, but hubs modified it so it would. I don’t use mine as often as you use yours. I use it mostly for pie crusts, cutting butter into flour for pastries, chopping or grinding nuts and for finely chopping veggies for relish. Sometimes I use it to chop bulk amounts of onions. I rarely use it for any other veggies and almost never use the shredding or slicing blade, since I am only feeding 3 people and am quick with a knife. I also use it often for grinding soap bars to make homemade laundry detergent. I like having it and when I found another Hamilton Beach – never used – at a garage sale recently, I grabbed it for a back up when I current one wears out completely. For the small amount of use mine gets, I can’t justify the cost of a Cuisinart. 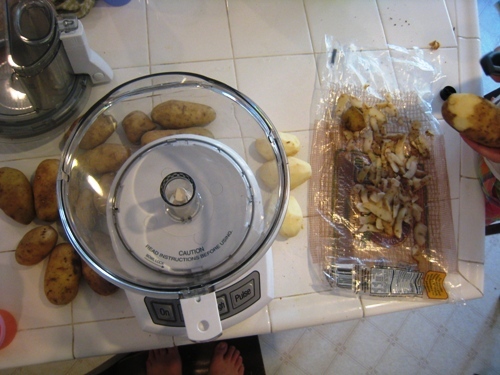 BTW, I also have a mini-chopper/processor and find it more convenient for small amounts of chopped veggies or nuts. @jan, love it that hubby is the food processor-er. I had a mini and it just wasn’t worth it. I almost always had to pull out the bigger machine to get the job done right. But, in the comments section, others are saying they really like theirs. My kitchen would not be complete without my food processor. Again, with three of us, it doesn’t get the work it would if the fam was larger. Looking forward to a redesigned kitchen to get a cabinet to store it in and get it off the counter. Love the speed–I am so slow with a knife. And I still have the same machine I got for my wedding, I think. Unless we took over my mother-in-laws machine. Either way, the one we use is more than a decade old. Downside? Clean up. Lots of individual parts that get dirty. And each one needs to be washed since they all seem to get whatever I am prepping on them. The food processor I use is a Hamilton Beach model and it was FREE off of the local “freecycle” list where people post things they don’t want anymore. I scored! In the past I only used it to make salsa and tomato sauce but after receiving and reading your cookbook, it was put to work this weekend making 10 pie crusts and 2 batches of oatmeal thumbprint cookies! ;) Never has pie crust been so easy, thanks Jessica! Dh got me a Cuisinart food processor about three years ago. It was bought to replace my trusty Presto SaladShooter. I loved that thing! The food processor is heavy and big and lives in the pedestal drawers underneath my dryer (main floor) so that I can keep it all together. The sharp blades scare me, so I keep the blade and disks in the bowl. I probably use it a few times a month for slicing potatoes, shredding cheese, slicing or shredding veggies. I used my SaladShooter all the time because it was more convenient, less parts, and easier to clean. I forgot that you could use the food processor for pie crusts or salsa. I’ll have to try that sometime! Hmm! @Cheri A, I love my salad shooter too, I will cry when it dies! So much easier to use and clean than my food processor and the kids love to run it. I love my food processor to make chicken/tuna salad. It chops the onion, celery, and peppers for me! And if I end the week with extra veggies, I shred them and freeze them for soups and stuff. My first food processor was a baby shower gift for my first child 28 years ago! After opening it, I must have looked surprized, more like a wedding shower gift, was she showing the first signs of dementia?? I met her eyes and she said, I knew you would want to make your own baby food!! She knew me better than most. I used the life out of that food processor and probably five more, I have blown the motor on several. I now have a cuisinart, no gaskets thankfully. My husband purchased it for me a few years ago as a birthday gift when I continued to complain that my girlfriends hummus was much better than mine (I have since discovered it was not the processor, but me). I do love my food processor, it is used non-stop during harvest season, pesto, pickles, salsa, tomato sauce…. I love our kitchen aid food processor! And yes, it’s definitely wonderful for big cooking sessions. I have a Black and Decker food processor that my lovely husband bought for me a couple of Christmases ago. I LOVE it! Shredding veggies and making salsa are the most common jobs and it also smoothes out my refried beans. My oldest loves my homemade veggie burgers that I mix in it, and I love making fast work of brick cheese. That was until the spindle broke for the disks…bummer. I’ve neglected to go on line and order a new one, which I really need to do! Before this processor I used an itty bitty $10 processor someone gifted me. (I think you can get them now from your favorite drugstore.) It can shred the heck out of a carrot or an onion and make bread crumbs from crutons or cereal flakes. This little thing is still going strong and good for quick little jobs that I don’t want to take out its larger counterpart. It does not have any attatchments just the rotating blade. I cannot vouch for newer versions, I have had mine for about 15yrs and I love it! My husband bough me a Cuisinart for my birthday about 10 years ago. It had three blades, four discs, and an extra bowl. I love it! I buy cheese in 5-lb blocks at Sam’s and shred them. I make pizza dough in it. I grind nuts in it. I make cookie dough in it. I chop veggies in bulk in it. The plastic housing that contains the safety feature on the lid broke about 3 years ago, and I used duct tape to hold the plastic in place; otherwise, it wouldn’t run. Occasionally the duct tape would stretch, and I would have to replace the tape or hold it together myself while I was using it. About a month ago my husband realized what I had been struggling with and bought me a new lid. 🙂 I love that man. He knows me so well. I am loving my Cuisinart! It’s great for almond meal and almond butter. About 30 years ago, my mom gave me her extra food processor but it wasnt a Cuisinart. I used it for years until it finally broke. M’honey went on Ebay and bought me on that looks like your photo above with the square base and I used that until I was making dough in it one day and it sounded like I stripped the gears or something. I’d been watching the newer Cuisinart DLC-2007N Prep 7 7-Cup Food Processor (52% off now @ Amazon) and decided to buy it then. I would have loved to have a larger one, but this one works perfectly fine for my use. If I have more than 7 cups, I just empty and go again. A good food processor is the one thing I would NOT do without. I could live without any other kitchen appliance but not this one. I will forever & always have one & I’ve bought both of my daughters one as well. I dont want them to ever be without one as well. Oh, now I’m getting nervous. My processor was a Valentines gift (I love kitchen toys) nearly 25 years ago. It’s a Braun Mulltipractic. A few years after I got it we moved to a very small house that had no kitchen space so it was sort of in storage and used very little for nearly ten years. Now it lives on my counter and gets used a lot. I dropped the plunger on the tile floor and replaced that when I found an identical machine at the thrift store. I kept the bowl, lid, plunger and blade because they are all easy to wash. The machine base was very, very dirty so I got rid of it. Now my machine will only work on the pulse setting. You can hold the dial in the on position, but when you let go, it shuts off. I have seen another of the same machine in a box at the same thrift store, before I started needing replacements. I sure hope a third one shows up! It is loud when I’m doing something like chopping frozen cranberries, but not when I’m making biscuits. Mine is a lower cost basic machine. I only use it during the summer when I make pesto to freeze and salsa and condiments to can. Not worth having to clean it the rest of the year when cooking for 2. I had a Montgomery Wards food processor about 15 years ago and it killed itself! Well ultimately it was my fault but how was I to know you had to hold on to the dang thing lest it vibrate and rock itself right off the counter when in use! hahaha.. it was replaced by the Cuisinart Pro Custom 11 that I got for free at a garage sale. The lady was selling it for $10 in the box with all the accessories plus some extras. I asked her if I could plug it in to make sure it worked. She couldn’t for the life of her figure out how to turn it on so she just turned around and told me to take it. Once I got home and read the manual, I turned it on and it has been in constant use since. We recently downgraded (3 bdrm house to 1 bdrm junior apartment) and I got rid of so many kitchen appliances but managed to find room for this baby and my KitchenAid mixer! I could not live without my Cuisinart 7 cup food processor. I bought it about 3-4 years ago and I think I have used it every day since. I can see where some people may never use it, but if you cook in any quantity at all it’s worth it’s weight in gold. So fast for prep! I’m a personal chef and go into people’s homes to cook for them and if they don’t have a processor, I drag mine. Besides, my family is addicted to homemade “slushy” salsa and I can make it in about 1 minute in my processor. Last Christmas my mom bought me a mini one (like maybe a cup!) and I just used it 1/2 an hour ago to chop chicken for hubby’s chicken salad for lunch tomorrow! It’s a pain because it is so small so i can only put so much in at a time, but I have used it crush an entire bag of Oreos to make Oreo truffles! Someday I would like to invest in a bigger model and a bread machine, but most of all I want a kitchen aide mixer! @MomofTwoPreciousGirls, I was very underwhelmed by my KitchenAid mixer. Still am. @Jessica, I’m more of a baker than a cook and when I need to bake for school I have to mix 6 batches! Takes forever, especially with my $5 Walmart hand mixer! I’m so thankful to discover that I’m not the only one who has super-glued my bowl back together to get some extra life out of it! I got my first one used from my mom. It was a Royal she never used. It was a work horse, I could shred frozen mozz cheese in it. I had it about 10 years. It was well worn I had replaced the bowl 2 time, due to breakage. It finally wore out, I tried to have it fixed but it would have cost more then a new one. Oh how I loved that machine. My next one was a Cuisinart. I was not impressed, but it was also a free, brand new in a box. I wore it out in less then a year and broke the handle off the bowl. Here come another free be in a box, needless to say another Cuisinart. I thought oh good bigger and stronger from the last. I still hated it. I continued to use it for a few years, until i wore it out.. I decied I wanted the big Kitchen aide. It got delivered on a day I was making 6 batches of lasagna for the freezer. I broke it on the first mozzarella ball. Back it went for a replacement. I used the repacement for 3 months then the motor stopped called kitchen aide and asked them to buy it back. I was done with food processors. I have been hand grating for 3 years now. I am now waiting for a Magimix by Robot-Coupe Food Processor, 16-Cup. I love the warranty, but hate the price. My hubby about died when he saw the price. But over the last 23 years of food processors, I have decided I have earned it. I cook for 4 boys who eat me out of house and home. I like having a well stocked freezer and they like to eat. My middle child Kaidin told my hubby, Mom needs it. Jessica, I’m curious how the food processor compares to a blender. I use my blender a lot for salsa, smoothies, chopping oats, cracker/bread crumbs, etc. Do you think a food processor would work for smoothies? I don’t know if I want both (little storage space) and we would miss our smoothies! Or maybe an immersion blender (smaller than a regular blender) would work for smoothies? 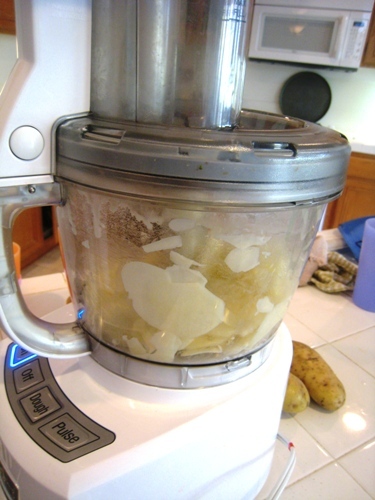 My first experience with a food processor was the early 80’s when the Cuisinart was popular. My parents had it and it seemed like such a pain to haul out, put together, take apart, clean, put away, that it hardly ever got used. I never thought about it again until about 3 or 4 years ago when so many recipes were calling for one. I found one at a yard sale for $4 and figured I’d try it. Worked great and lasted a year before the drive adapter stripped and rendered the whole thing useless. Not long after I got an unexpected check and hubby said I could use it any way I wanted. I wanted an awesome food processor, so I did the research and chose the Kitchen Aid 13 cup model. It had a few low ratings in reviews, but so did all the Cuisinart models I looked at and since I like my KA stand mixer that’s the brand I ordered. BIG mistake! It was horrible! Cheap plastic adapters that broke too easily. I just recently managed to get KA to buy it back and was reading other brand’s reviews and am seeing the same problem. Very frustrating that this is what production has come to. I wish I could find the old model Cuisinart. Not sure what to get to replace this one, maybe just keep my eyes open for another one at yard sales! speaking of food processors and your newfound enjoyment of cashews, have you tried making your own cashew butter? I think I remember reading about your use of almond butter. Cashew butter is our favorite. Preferred to peanut butter actually. So delicious. And all we do is blend the cashews until they reach the consistency of a chunky peanut butter. If you want it a bit smoother you can add a bit of water while blending, doesn’t hurt the flavor or anything. But if you made a large batch and had leftovers it should be stored in the fridge. I learned this the hard way after opening up molded a jar of homemade peanut butter that wasn’t stored in the fridge. I love my food processor, it’s 12 cup Cuisinart that was a gift from my parents for my wedding. It probably spends more time dirty than clean! I use it for everything from grating cheese, to slicing veggies to blending up fruit for sorbet! Fortunately the kitchen in our rental is colossal so I don’t have to put it away, it stays out on the counter. I can’t wait to see how long this beast lasts. Last summer the handle on my Kitchen-aid food processor’s bowl broke, and I couldn’t find a replacement (I since have..I wish I had waited a little longer) That particular model had the “safety” clip thingy built into the handle. No handle. No operating processor. So I “upgraded” to the 13 cup (with the adjustable blade). It does have some nice features, but just doesn’t seem to have the same power chopping or maybe it is just that it is a little slower since the capacity is greater. The shredding/slicing is GREAT! Regardless, I don’t think I could be without a food processor for very long. There are just certain jobs for which a food processor is quicker/easier/better! I also realized the reason my last bowl cracked/handle broke was because of the high temperatures in my dishwasher. I had hand-washed it until about 6 months before it broke. I had told myself that since it was “dishwasher safe” that it was really a waste of my time to hand-wash it. Hindsight! Therefore I was determined that the new one would never go into the dishwasher. My resolve was short-lived..the new one has a gasket that the old one did not, making it VERY difficult to clean by hand. Then I had a DUH-moment. I do use the dishwasher to clean it, BUT only on the China cycle…less heat, less likely to crack! Reading this, it occurred to me that maybe my issues with plastic parts, as well, is that they aren’t meant for dishwashers, which run hot (especially our Bosch). My main thing, though, is that the blades do get dull, no matter how careful I am, especially the grating blade, for some reason. But you’ve inspired me to use my kitchen appliances more often, especially with that pie crust recipe, which I’m going to try with whole wheat flour blend. Thanks! I got a Cuisinart for Christmas from my hubby! LOVE it! As my cooking has got more serious as a stay at home mom over the last few years, I realize how much I need it. Baby food, hummus, black bean spread, grated cheese, pie crust, lemon cheesecake squares, cookie dough, banana bread…all things I’ve made in the last month. The BEST for bulk freezer cooking for a young family. You should try the magimix 5200xl made in France by robot coupe . 20 yr guarantee amazing 3 nesting bowls and just look it up, robot coupe is restaurant chefs choice . With your kitchen aid and that you are unstoppable ! Thanks for your review and everyone’s comments. Hubby recently broke the white plastic disk which holds my shredding or slicing blades on my 25 year old Moulinex. A review of ebay yields a similar result to Jessica’s: a replacement piece will be very expensive. But *thank you* for the reminder about tag sales and resale shops! I’ll be heading out to look around this week.